Bertsch Nancy Summer House Pavilion: The Bertsch Nancy Summer House Pavilion is a Hexagonal (6 sided) Summer House featuring Double Doors on 5 sides and one solid wood side. 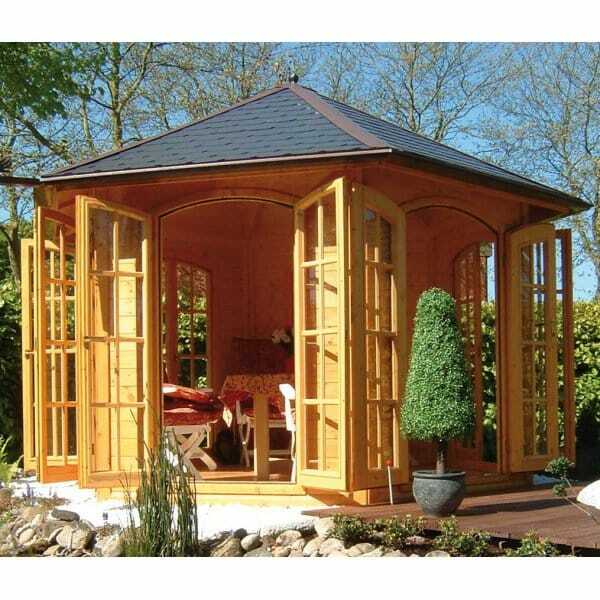 The Bertsch Nancy Summer House can be used as a great entertainment venue or even as a sunny tea room, the double doors opening on all sides is a great features of this Hexagonal Summer House from Simply Log Cabins. Shingles are available to buy please see below for detail.